I often receive requests for advice on “transitioning” pets to a new food, so let’s discuss this issue in detail today—and hopefully clear up some long-held misconceptions along the way. Now, even though I know we’re never supposed to “assume” things, I’m taking a leap here, since the entire premise of “proper” food transitioning involves getting your companion animal off of one food and onto another without wreaking havoc on his gastrointestinal system. Given that premise, you probably think this is a post about doing just that. Well, you should know me better than that by now! Instead, we’re going to “shake things up” a bit and get you to think deeper about how you feed your dog. Like humans, dogs should be eating a variety of nutritious foods, and not living on just one specific formula. Single formula diets set the stage for a sub-par digestive system. Imagine that from the time you were a child, your parents fed you only chicken and rice every day. Day in and day out, for breakfast, lunch and dinner, you ate chicken and rice. They even packed it for your school lunches! Then, one day, you grow up and head off to college away from home, and you are shocked to find that the cafeteria doesn’t offer chicken and rice! Reluctantly, you decide to try something new and fill up your plate with meatloaf, mashed potatoes with gravy and steamed broccoli. You find that you love it, and you wonder why your mother never fed it to you before. But later that night, back in your dorm room, something unsettling occurs. Your stomach starts to gurgle. You feel gassy and bloated. Suddenly, you are experiencing a full-blown digestive emergency (need I say more?). Certainly, you think, there must have been something wrong with the food because it most definitely did not agree with you! Was there anything wrong with the meal? Most likely not. The only thing “wrong” was that the beneficial bacteria in your digestive tract, which are responsible for breaking down food, were not accustomed to meatloaf, mashed potatoes with gravy and steamed broccoli. Had you slowly and meticulously added a little bit of your new food to your chicken and rice over the course of a week or two, your gut bacteria could have adjusted without becoming overwhelmed until you completed your transition. Feeding our pets a restricted diet for months or years creates an environment inside their guts where any new food is considered a foreign invader, and the bacteria don’t know what to do with it. This often results in the gas, bloating and loose stools that perplex so many well-intentioned pet parents as they seek to “transition” their four-legged companions from one food to another. Even those of us who are used to eating a variety of foods common in the United States would likely experience some digestive upset if all of a sudden we were plunked in a foreign country where the cuisine was alien to our gut bacteria. No one dietary formula, no matter how “complete and balanced” it is, can meet all of an animal’s nutritional needs over an extended period. Think of some of the healthiest foods in the world—let’s say spinach, wild salmon, sweet potatoes and blueberries. Eating these foods would provide an excellent protein source as well as a wide variety of phytonutrients. But, eaten every day, even these healthy foods will create nutritional deficiencies over time. Our bodies run on rhythms. Most of us sleep when it’s dark and are active when it’s light. We feel differently in the winter months than in the summer months. We crave different nutrients when we’re sick than when we’re well. The same is true after we exercise. In other words, the nutritional needs of humans and animals vary depending upon many factors that are constantly changing. Breaking an animal’s nutritional requirements into “life stages” separated by many years—or by specific condition—greatly oversimplifies their physiological complexity. If you continually feed them the same food, over time your pet can become deficient in some nutrients. Varying the diet brings in potentially missing nutrients, allowing the body to self-correct. Consider, for example, that each type of protein offers a different amino acid and nutrient profile. So, feeding your pet eggs will provide certain essential amino acids, while fish, chicken, etc. will provide others. The same holds true for fruits and vegetables. There is no one “perfect” food or perfect food combination that provides everything a human or animal needs to create optimum health over long periods. Chances are that your pet’s current diet and the diet to which you’re transitioning contain one—perhaps two—protein sources. But if you recall my past discussions on food sensitivities (also called food intolerances), you’ll remember that excessive exposure to a particular animal protein is a major culprit in creating the environment we have today of the ever-increasing food sensitivities among companion animals. The reason so many pets are intolerant of chicken and beef is because these protein sources were the mainstay of the pet food industry for many years. When pet food manufacturers realized this, they decided to introduce lamb as a “novel” protein source. But while “novel” proteins are less likely to trigger an immune response, even the most exotic animal protein is no longer exotic to your pet if he eats it continually. Manufacturers found that out when many animals began forming sensitivities to lamb, forcing them to introduce newer and more novel animal sources such as venison and ostrich! Rotating protein sources not only ensures your pet will benefit from a varied amino acid and nutrient profile, it also reduces the risk he will form an intolerance to any specific animal protein source over time. Eating one food combination all the time is just plain boring! This one really doesn’t require much explanation. Think of your favorite food—the one where you say, “I could eat that every day for the rest of my life!” Now, picture that you really CAN eat that food ever day for the rest of your life, but you can’t eat anything else! Every day for breakfast, lunch and dinner, your “favorite” food awaits you. I bet after a pretty short time, it won’t be your favorite food anymore! People often fret that their pet has become a “finicky” eater. It’s no wonder. They’re probably on strike hoping for something new to tantalize their taste buds! Hopefully, you’re seeing the many problems that can result from feeding your companion animal one dietary formula for months or years. If you’re still not convinced (and I hope you are!) think about whether such a strategy mimics how your pet’s ancestors ate in the wild. Of course not! Those animals hunted and ate whatever they could catch, and devoured the stomach contents of that animal along with the flesh, organs and bones. So, they definitely ate a variety of foods that provided them with a rich and varied source of nutrients—and I’m betting they didn’t suffer from gas and diarrhea! That being said, I promote dietary rotation rather than transitioning. Rotating provides our pets with all the nutritional benefits described above while also creating a strong intestinal environment. If you use a commercial food, rotating should involve using different formulas in that line so that your pet benefits from a variety of animal proteins, fruits and vegetables. You can also rotate among several high-quality brands to ensure additional nutritional variety. If your pet has been eating one dietary formula for months or years, you obviously don’t want to suddenly bombard his GI system with several new foods—this would be a sure recipe for disastrous digestive upset! You have a bit more leeway if you cook for your dog, because you are not bound to a particular “formula”; simply introduce a new item gradually until it becomes an integral part of your dog’s diet. As you discovered from my post about probiotics, I strongly recommend supplementing your pet’s diet with a high-quality, live probiotic to promote overall digestive and immune health. The beneficial bacteria provided in probiotics are especially important when introducing new foods because they provide “reinforcements” to the current gut flora. You should also make sure that any new foods you introduce promote optimum health for your individual pet. If you’re concerned that your companion animal might harbor a food sensitivity, consider testing him first with NutriScan. This saliva-based test is a simple method to determine if he is intolerant of one or more common food ingredients. Currently, NutriScan tests for 22 of the most common food reactants. 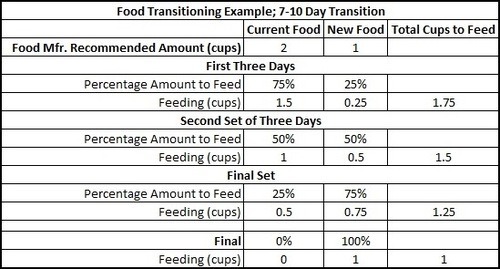 I hope by now you’re on board with the idea of rotating many nutritious foods into your pet’s diet rather than simply transitioning from one formula to another. Rotating will not only promote optimum health for your pet — it will promote a happy four-legged companion!